Hello everyone. Well it's the beginning of a new month, and for us here at DownUnder Inspirations this month welcomes our three new Design Team members. Earlier this month we introduced the new team members over on our Design Team page and starting from today we will be sharing their fabulous creations here with everyone. We have some special projects planned for this month as we celebrate Christmas in July once again. For one week we will be showcasing some fantastic Christmas themed projects that are sure to get you thinking about your own holiday crafting. Starting on Sunday July 22nd we will have seven full days of festive inspiration, so be sure to join us here. So on to today's project. 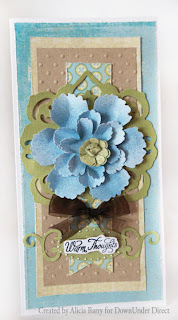 Alicia has used the Spellbinder die Rose Creations to create this stunning card. Gorgeous work Alicia, the colours are so pretty. Love that flower die, might have to put it on my wishlist. Beautiful flower and super cute card too! 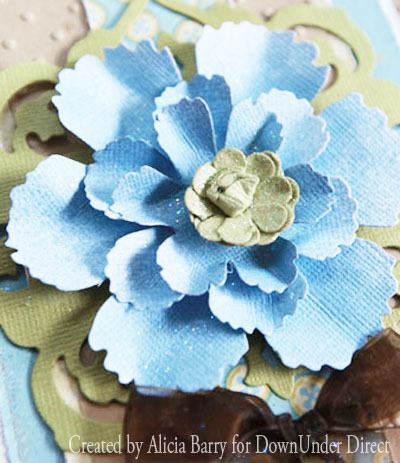 Thanks for sharing such a great idea for using the Spellbinders dies! Well done Leish - gorgeous!!! !